I use this all the time, and the setup is dead simple. Follow the code below to load the RMySQL package, connect to a database (here the UCSC genome browser's public MySQL instance), set up a function to make querying easier, and query the database to return results as a data frame. 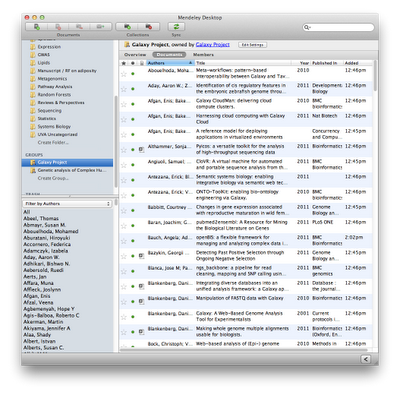 The Galaxy Project started using CiteULike to organize papers that are about, use, or reference Galaxy. The Galaxy CiteULike group is open to any CUL user, and once you join, you can add papers to the group, assign tags, and rate papers. 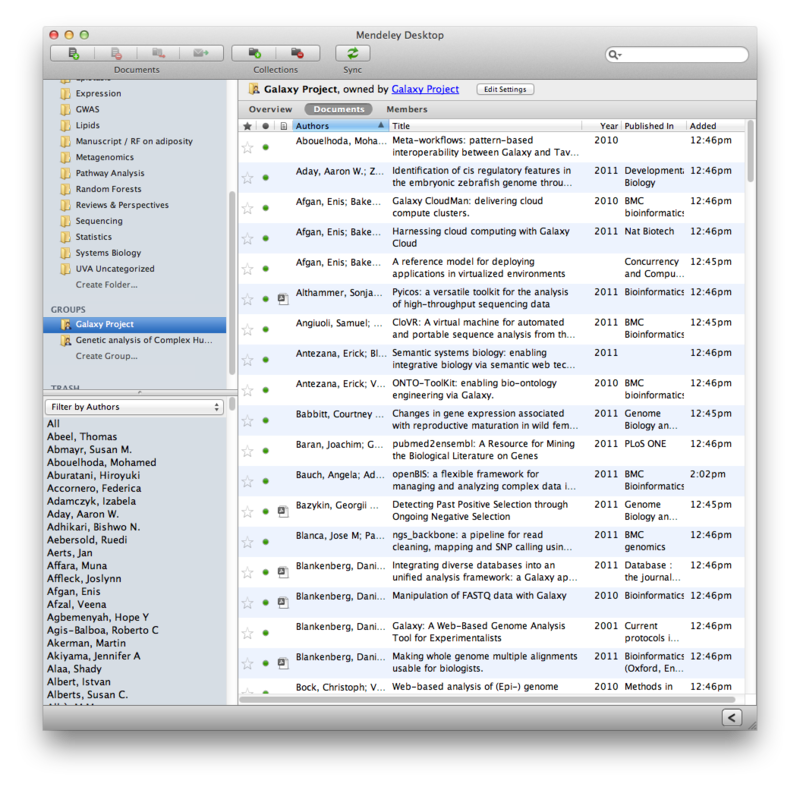 While not a CUL user, I'm a big fan of Mendeley for managing references, PDFs, and creating bibliographies (and so are many of you). 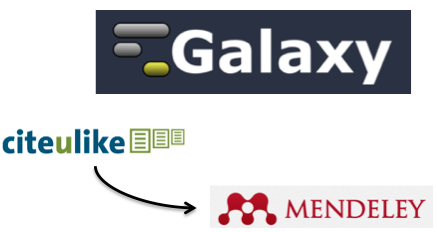 I'm happy to hear that the Galaxy folks also set up a Galaxy Mendeley Group, also open to the public for anyone to join. If you join the Galaxy public Mendeley group, all of the groups references will show up in your Mendeley library (and these won't count against your personal quota). Just one important thing to note: The Mendeley group is a mirror of the CiteULike group, so if you want to add more publications to the Galaxy Group, add them on CiteULike, not Mendeley (it doesn't work the other way around - papers added to Mendeley won't make it to the CUL group). I just got an email from Illumina about a webinar that looks interesting this Wednesday at 9am PST (noon EST) on clinical applications of next-gen sequencing. Next-generation sequencing (NGS) presents both challenges and opportunities for clinical care. Dr. Dewey will share examples from his experience at Stanford, successful and otherwise, in which NGS has been applied to cases of familial cardiomyopathy, and other inherited conditions. Bring your questions for a Q&A session. In this webinar, Dr. Dewey will discuss approaches to: Data storage and management; Error identification and reduction; Disease risk encoded in the reference sequence; and Variant validation. The webinar will be recorded and available to you afterwards if you register. BioMart recently got a facelift. 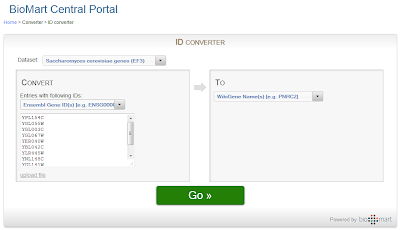 I'm not sure if this was always available in the old BioMart, but there's now a link to a gene ID converter that worked pretty well for me for converting S. cerevisiae gene IDs to standard gene names. It looks like the tool will convert nearly any ID you could imagine. 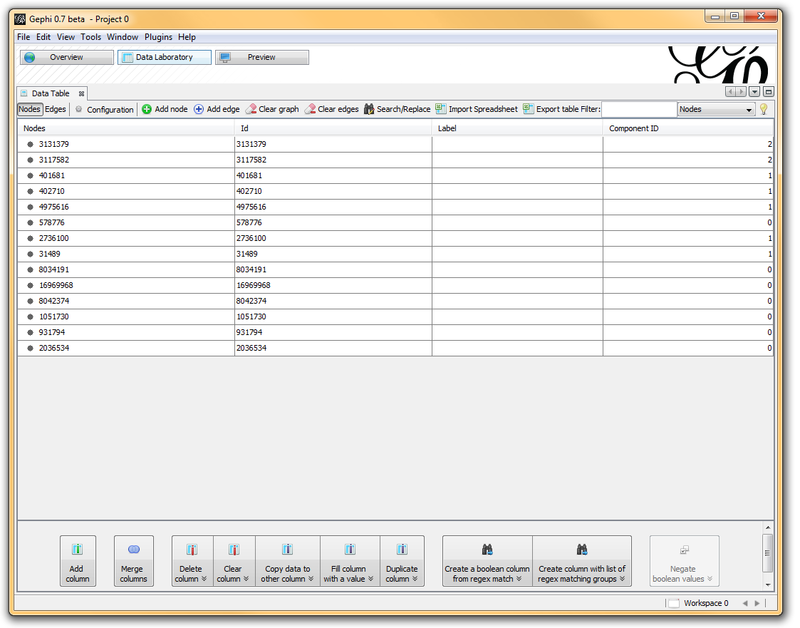 Looks like it will also map Affy probe IDs to gene, transcript, or protein IDs and names. Gene Expression Omnibus is NCBI's repository for publicly available gene expression data with thousands of datasets having over 600,000 samples with array or sequencing data. You can download data from GEO using FTP, or download and load the data directly into R using the GEOquery bioconductor package written (and well documented) by Sean Davis, and analyze the data using the limma package. GEO2R is a very nice web-based tool to do this graphically and automatically. Enter the GEO series number in the search box (or use this one for an example). 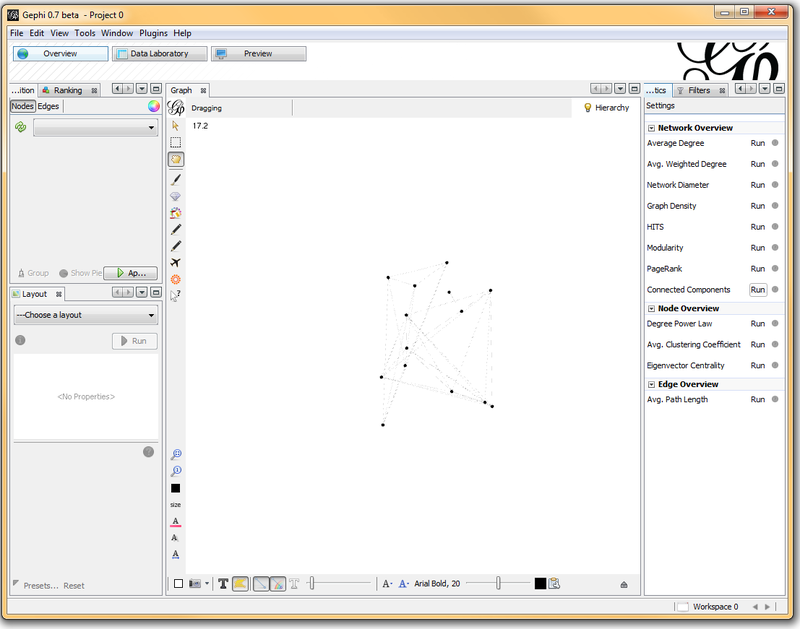 Start by creating groups (e.g. control vs treatment, early vs late time points in a time course, etc), then select samples to add to that group. Scroll down to the bottom and click Top 250 to run an analysis in limma (the users guide documents this well). GEO2R will automatically fetch the data, group your samples, create your design matrix for your differential expression analysis, run the analysis, and annotate the results. A big complaint with point-and-click GUI and web based applications is the lack of reproducibility. GEO2R obviates this problem by giving you all the R code it generated to run the analysis. Click the R script tab to see the R code it generated, and save it for later. 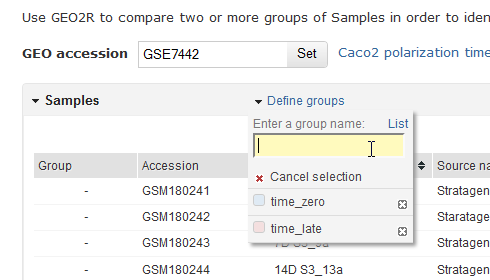 The options tab allows you to adjust the multiple testing correction method, and the value distribution tab lets you take a look at the distribution gene expression values among the samples that you assigned to your groups. There's no built-in quality assessment tools in GEO2R, but you can always take the R code it generated and do your own QA/QC. 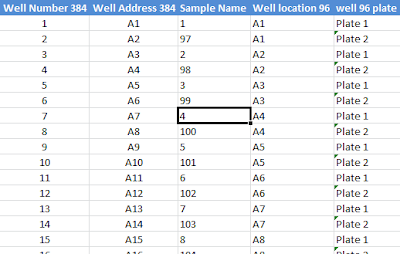 It's also important to verify what values it's pulling from each array into the data matrix. In this example, epithelial cells at various time points were compared to a reference cell line, and the log base 2 fold change was calculated. This was used in the data matrix rather than the actual expression values. GEO2R is a very nice tool to quickly run an analysis on data in GEO. Now, if we could only see something similar for the European repository, ArrayExpress. In general, the standard practice for correcting for population stratification in genetic studies is to use principal components analysis (PCA) to categorize samples along different ethnic axes. Price et al. published on this in 2006, and since then PCA plots are a common component of many published GWAS studies. One key advantage to using PCA for ethnicity is that each sample is given coordinates in a multidimensional space corresponding to the varying components of their ethnic ancestry. 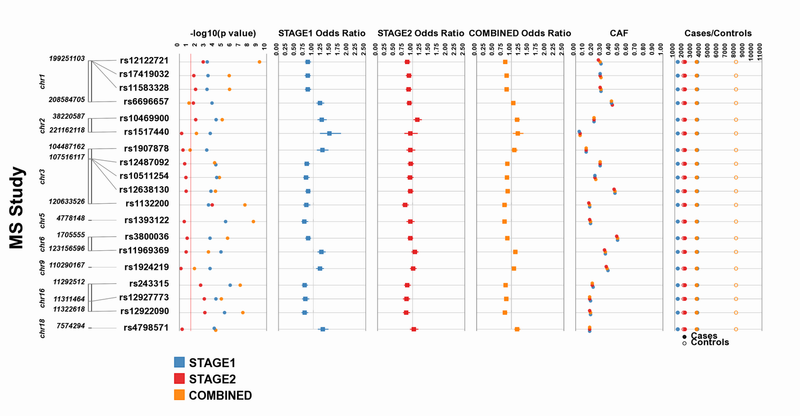 Using either full GWAS data or a set of ancestral informative markers (AIMs), PCA can be easily conducted using available software packages like EIGENSOFT or GCTA. 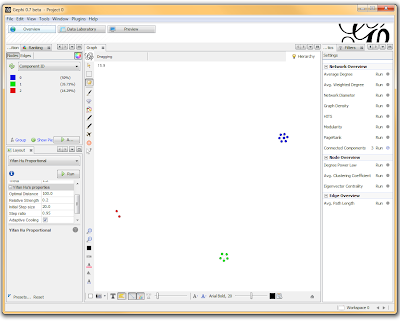 HapMap samples are sometimes included in the PCA analysis to provide a frame of reference for the ethnic groups. 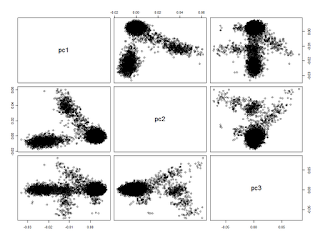 Once computed, each sample will have values that correspond to a position in the new coordinate system that effectively clusters samples together by ethnic similarity. The results of this analysis are usually plotted/visualized to identify ethnic outliers or to simply examine the structure of the data. A common problem however is that it may take more than the first two principal components to identify groups. So this is where my mind plays tricks on me. I can't make much sense out of these plots -- there should be four ethnic groups represented, but its hard to see who goes where. To look at all of these dimensions simultaneously, we need a 3D plot. Now 3D plots (especially 3D scatterplots) aren't highly regarded -- in fact I hear that some poor soul at the University of Washington gets laughed at for showing his 3D plots -- but in this case I found them quite useful. Now, using the mouse I could rotate and play with the cloud of data points, and it became more clear how the ethnic groups sorted out. Just to double check my intuition, I ran a model-based clustering algorithm (mclust) on the data. Different parameters obviously produce different cluster patterns, but I found that using an "ellipsoidal model with equal variances" and a cluster size of 4 identified the groups I thought should be there based on the overlay with the HapMap samples. I had to scale the uncertainty factor by 10 to make the questionable points more visible in this plot, shown as the hollow circles. We will likely drop these samples from any stratified analyses. We can export the cluster assignment by accessing the fit$classification column, and we have our samples assigned to an ethnic group. I’m a bit exhausted from a week of excellent science at ICHG. First, let me say that Montreal is a truly remarkable city with fantastic food and a fascinating blend of architectural styles, all making the meeting a fun place to be…. Now on to the genomics – I’ll recap a few of the most exciting sessions I attended. You can find a live-stream of tweets from the meeting by searching the #ICHG2011 and #ICHG hashtags. On Wednesday, Marylyn Ritchie(@MarylynRitchie) and Nancy Cox organized “Beyond Genome-wide association studies”. Nancy Cox presented some ideas on how to integrate multiple “intermediate” associations for SNPs, such as expression QTLs and newly discovered protein QTLs (More on pQTLs later). This approach which she called a Functional Unit Analysis would group signals together based on the genes they influence. Nicholas Shork presented some nice examples of pros and cons of sequence level annotation algorithms. Trey Idekker gave a very nice talk illustrating some of the properties of epistasis in yeast protein interaction networks. One of the more striking points he made was that epistasis tends to occur between full protein complexes rather than within elements of the complexes themselves. Marylyn Ritchie presented the ideas behind her ATHENA software for machine learning analysis of genetic data, and Manuel Mattesian from Tim Becker’s group presented the methods in their INTERSNP software for doing large-scale interaction analysis. What was most impressive with this session is that there were clear attempts to incorporate underlying biological complexity into data analysis. On Thursday, I attended the second Statistical Genetics section called “Expanding Genome-wide Association Studies”, organized by Saurabh Ghosh and Daniel Shriner. Having recently attended IGES, I feel pretty “up” on newer analysis techniques, but this session had a few talks that sparked my interest. The first three talks were related to haplotype phasing and the issues surrounding computational accuracy and speed. The basic goal of all these methods is to efficiently estimate genotypes for a common set of loci for all samples of a study using a set of reference haplotypes, usually from the HapMap or 1000 genomes data. Despite these advances, it seems like phasing haplotypes for thousands of samples is still a massive undertaking that requires a high-performance computing cluster. There were several talks about ongoing epidemiological studies, including the Kaiser Permanente UCSF cohort. Neil Risch presented an elegant study design implementing four custom GWAS chips for the four targeted populations. Looks like the data hasn't started to flow from this yet, but when it does we’re sure to learn about lots of interesting ethnic-specific disease effects. My good friend and colleague Dana Crawford presented an in silico GWAS study of hypothyroidism. In her best NPR voice, Dana showed how electronic medical records with GWAS data in the EMERGE network can be re-used to construct entirely new studies nested within the data collected for other specific disease purposes. Her excellent Post-Doc, Logan Dumitrescu presented several gene-environment interactions between Lipid levels and vitamin A and E from Dana’s EAGLE study. Finally Paul O’Reilly presented a cool new way to look at multiple phenotypes by essentially flipping a typical regression equation around, estimating coefficients that relate each phenotype in a study to a single SNP genotype as an outcome. This rather clever approach called MultiPhen is similar to log-linear models I’ve seen used for transmission-based analysis, and allows you to model the “interaction” among phenotypes in much the same way you would look at SNP interactions. By far the most interesting talks of the meeting (for me) were in the Genomics section on Gene Expression, organized by Tomi Pastinen and Mark Corbett. Chris Mason started the session off with a fantastic demonstration of the power of RNA-seq. 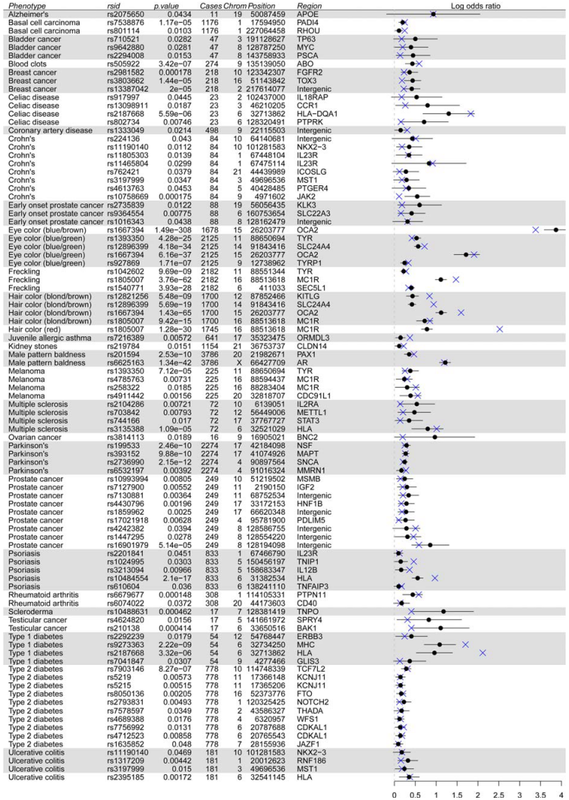 Examining transcriptomes of 14 non-human primate species, they validated many of the computational predictions in the AceView gene build, and illustrated that most “exome” sequencing is probably examining less than half of all transcribed sequences. Rupali Patwardhan talked about a system for examining the impact of promoter and enhancer mutations in whole mice, essentially using mutagenesis screens to localize these regions. Ron Hause presented work on the protein QTLs that Nancy Cox alluded to earlier in the conference. Using a high-throughput form of western blots, they systematically examined levels for over 400 proteins in the Yoruba HapMap cell lines. They also illustrate that only about 50% of eQTLs identified in these lines actually alter protein levels. Stephen Montgomery spoke about the impact of rare genetic variants within a transcript on transcript levels. Essentially he showed an epistatic effect on expression, where transcripts with deleterious alleles are less likely to be expressed – an intuitive and fascinating finding, especially for those considering rare-variant analysis. Athma Pai presented a new QTL that influences mRNA decay rates. 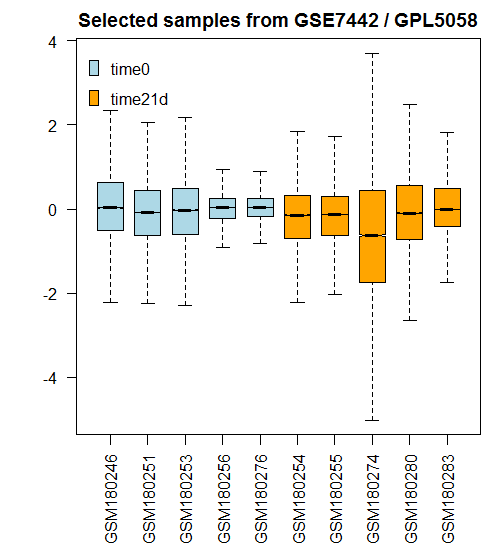 By measuring multiple time points using RNA-seq, she found individual-level variants that alter decay, which she calls dQTLs. Veronique Adoue looked at cis-eQTLs relative to transcription factor binding sites using ChIP, and Alfonso Buil showed how genetic variants influence gene expression networks (or correlation among gene expression) across tissue types. I must say despite all the awesome work presented in this session, Michael Snyder stole the show with his talk on the “Snyderome” – his own personal –omics profile collected over 21 months. His whole-genome was sequenced by Complete Genomics, and processed using Rong Chen and Atul Butte’s risk-o-gram to quantify his disease risk. His profile predicted increased risk of T2D, so he began collecting glucose measures and low and behold, he saw a sustained spike in blood glucose levels following a few days following a common cold. His interpretation was that an environmental stress knocked him into a pseudo-diabetic state, and his transcriptome and proteome results corroborated this idea. Granted, this is an N of 1, and there is still lots of work to be done before this type of analysis revolutionizes medicine, but the take home message is salient – multiple -omics are better than one, and everyone’s manifestation of a complex disease is different. This was truly thought-provoking work, and it nicely closed an entire session devoted to understanding the intermediate impact of genetic variants to better understand disease complexity. This is just my take of a really great meeting -- I'm sure I missed lots of excellent talks. If you saw something good please leave a comment and share! Like most bioinformatics nerds (or anyone with a facebook account), I’m fascinated by networks. Most people immediately think of protein-protein interaction networks, or biological pathways when thinking about networks, but sometimes representing a problem as a network makes solving problems easier. 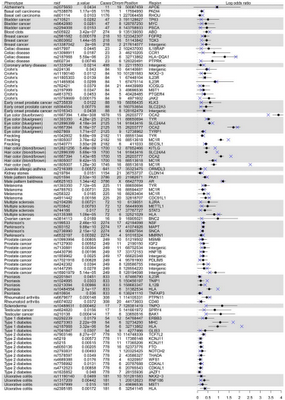 Recently, some collaborators from the PAGE study had a list of a few hundred SNPs gathered from multiple loci across the genome. 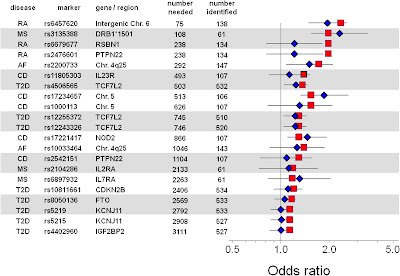 For analysis purposes, they were interested in quantifying the number of loci these SNPs represented – in other words, how many distinct signals were represented by their collection of SNPs. 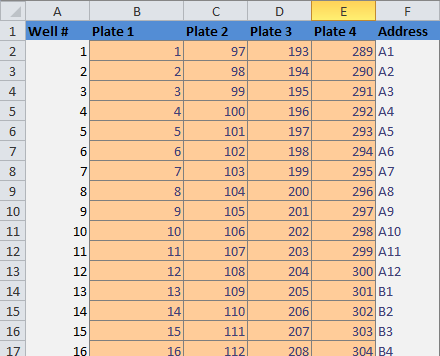 In a spreadsheet application, I sorted and filtered the LD pairings I wanted using either the r-squared or the d-prime columns. I then deleted any rows that didn’t meet my cutoff, renamed the header for SNP1 to “Source” and SNP2 to “Target”, and exported the file as a comma-separated file (.csv). 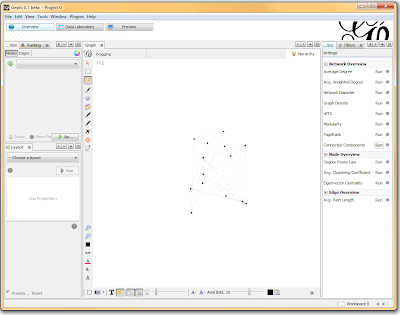 I opened Gephi, clicked the “Data Laboratory” tab, and Import Spreadsheet to load my data. Once loaded, I clicked on the “Overview” tab and I can see my graph. The graph looks like a big mess, but we don’t really care how it looks – we’re going to run an analysis. In the “statistics” tab on the right-hand side, you’ll see an option for “connected components”. This runs an algorithm that picks apart and labels collections of nodes that are connected. Running this only takes a second. I then click on the “Data Laboratory” tab again, and I can see that my nodes are labeled with an ID. 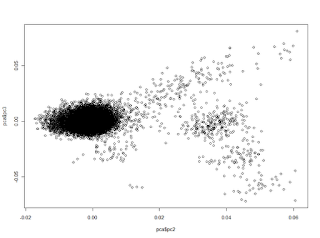 This corresponds to the Locus those SNPs represent. If you want to actually SEE how these relationships fall out, we’ll need to run a layout engine. 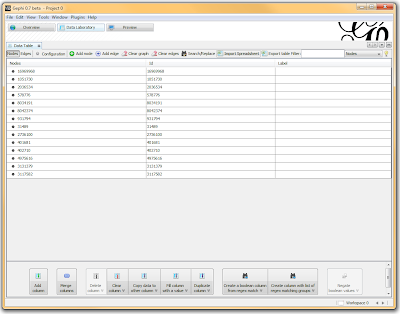 Back on the “Overview” tab, on the lower left-hand side, there is a drop-down allowing you to choose a layout engine. I have found YifanHu’s Multilevel to be the quickest and most effective for separating small groups like these. Depending on the size of your graph, it may take a moment to run. Once its finished, you should be able to see the components clearly separated. If you want, you can color code them by clicking the green “refresh” button in the “partition” tab in the upper left corner. 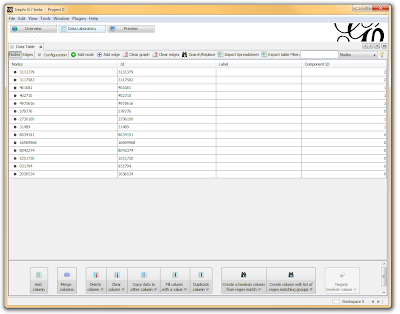 This reloads the drop-down menu and will provide you with an option to color the nodes by component ID. Select this, and click apply to see the results! I’ve used Gephi component analysis to do all kinds of fun things, like the number of families in a study using pairwise IBD estimates, looking at patterns of phenotype sharing in pedigrees, and even visualizing citation networks. Sometimes representing a problem as a graph lets you find patterns more easily than examining tables of numbers. I just accepted an offer for a faculty position at the University of Virginia in the Center for Public Health Genomics / Department of Public Health Sciences. Starting in October I will be developing and directing a new centralized bioinformatics core in the UVA School of Medicine. Over the next few weeks I'm taking a much-needed vacation next door in Kauai and then packing up for the move to Charlottesville. Posts here may be sparse over the next few weeks, but once I start my new gig I'll be sure to make up for it. And if you're bioinformatics-savvy and in the job market keep an eye out here - once I figure out what I need I will soon be hiring, and will repost any job announcements here. I've enjoyed my postdoc here at the University of Hawaii Cancer Center, and there is much I'll miss about island life out here in the Pacific. But I'm very seriously looking forward to getting started in this wonderful opportunity at UVA. Thank you all for your comments, suggestions, and help when I needed it. I'll be back online in a few weeks - until then, follow me on Twitter (@genetics_blog). I just read Gregory Cooper and Jay Shendure's review "Needles in stacks of needles: finding disease-causal variants in a wealth of genomic data" in Nature Reviews Genetics. It's a good review about how to narrow down deleterious disease-causing variants from many, many variants throughout the genome when statistics and genetic information alone isn't enough. However, true hypotheses are true, and false hypotheses are false, regardless of how many are tested. As such, the actual 'multiple testing burden' depends on the proportion of true and false hypotheses in any given set: that is, the 'prior probability' that any given hypothesis is true, rather than the number of tests per se. This challenge can thus be viewed as a 'naive hypothesis testing' problem — that is, when in reality only one or a few variants are causal for a given phenotype, but all (or many) variants are a priori equally likely candidates, the prior probability of any given variant being causal is miniscule. As a consequence, extremely convincing data are required to support causality, which is potentially unachievable for some true positives. Defining the challenge in terms of hypothesis quality rather than quantity, however, points to a solution. Specifically, experimental or computational approaches that provide assessments of variant function can be used to better estimate the prior probability that any given variant is phenotypically important, and these approaches thereby boost discovery power. 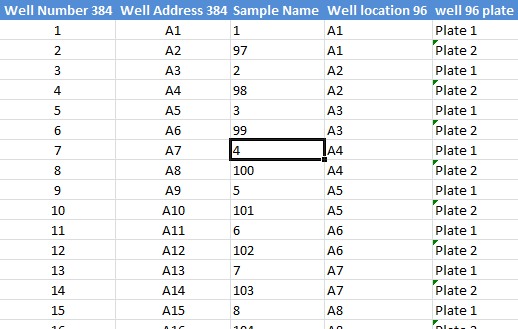 Daniel Cook in Jeff Murray's lab at the University of Iowa put together this handy Excel template for keeping track of how samples from four 96-well plates are interleaved to configure a single 384-well plate using robotic liquid handling systems, like the Hydra II. You can download the Excel file here. Thanks for sharing, Daniel. 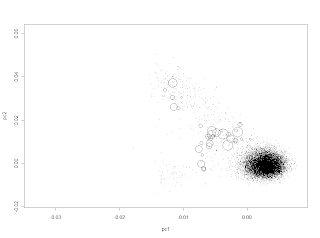 I just discovered a handy function in R to produce a scatterplot matrix of selected variables in a dataset. The base graphics function is pairs(). Producing these plots can be helpful in exploring your data, especially using the second method below. Try it out on the built in iris dataset. 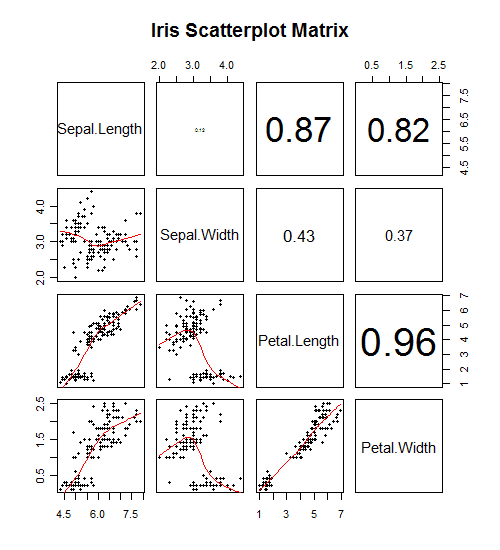 (data set gives the measurements in cm of the variables sepal length and width and petal length and width, respectively, for 50 flowers from each of 3 species of iris. The species are Iris setosa, versicolor, and virginica). 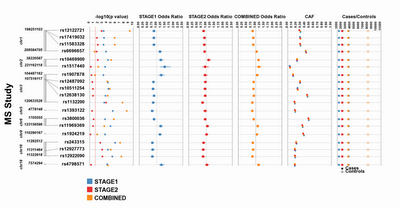 # Load the iris dataset. 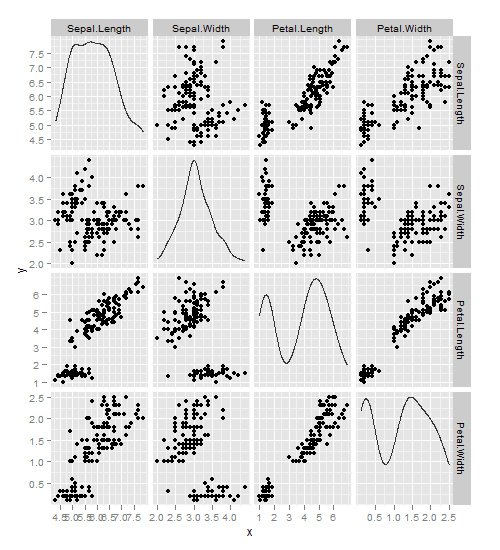 Looking at the pairs help page I found that there's another built-in function, panel.smooth(), that can be used to plot a loess curve for each plot in a scatterplot matrix. Pass this function to the lower.panel argument of the pairs function. 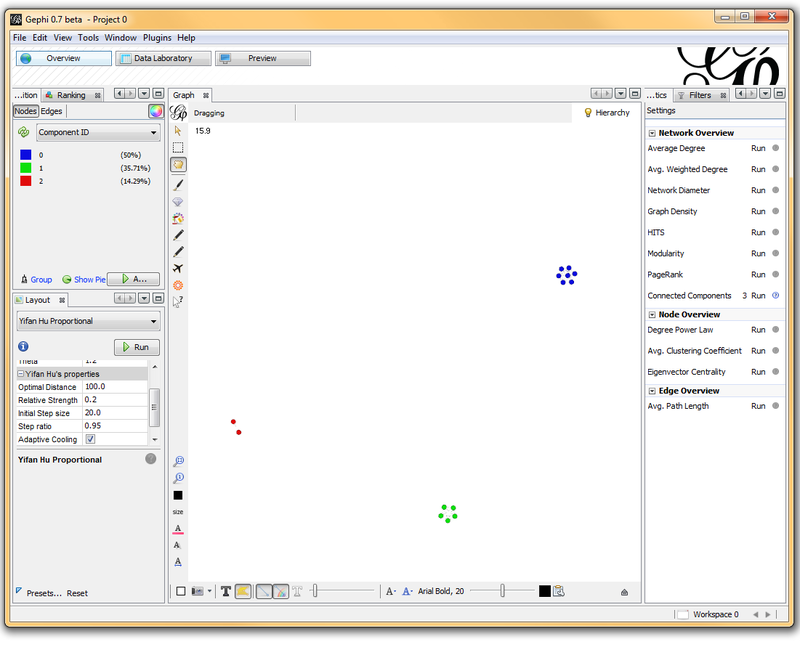 The panel.cor() function below can compute the absolute correlation between pairs of variables, and display these in the upper panels, with the font size proportional to the absolute value of the correlation. # panel.smooth function is built in. 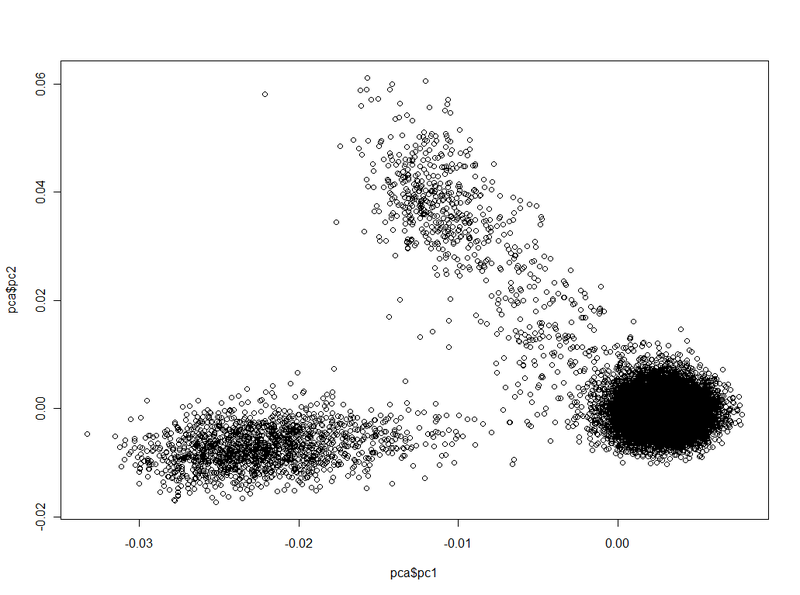 Finally, you can produce a similar plot using ggplot2, with the diagonal showing the kernel density. See more on the pairs function here. Update: A tip of the hat to Hadley Wickham (@hadleywickham) for pointing out two packages useful for scatterplot matrices. 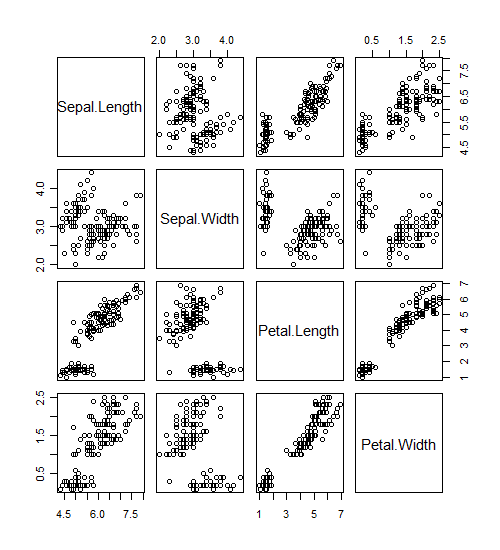 The gpairs package has some useful functionality for showing the relationship between both continuous and categorical variables in a dataset, and the GGally package extends ggplot2 for plot matrices. Sequencing company Complete Genomics recently made available 69 ethnically diverse complete human genome sequences: a Yoruba trio; a Puerto Rican trio; a 17-member, 3-generation pedigree; and a diversity panel representing 9 different populations. Some of the samples partially overlap with HapMap and the 1000 Genomes Project. 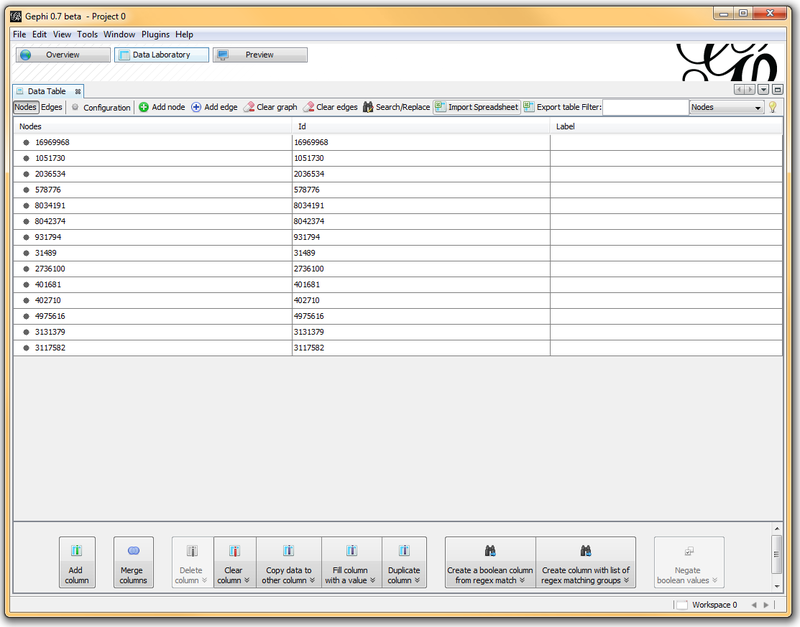 The data can be downloaded directly from the FTP site. See the link below for more details on the directory contents, and have a look at the quick start guide to working with complete genomics data.